The practicing pediatrician is often confronted with the evaluation and management of an infant, child, or adolescent with upper airway obstruction which may be life-threatening. To ensure a successful outcome, early and accurate diagnosis, careful and objective monitoring and management by a skilled, experienced, and well-equipped team at a facility capable of handling such a problem are required. Without such requirements, the outcome may result in significant morbidity and even mortality.1 Any patient with upper airway obstruction who reaches the hospital alive should not suffer further hypoxic central nervous system (CNS) damage or die. Despite current treatment principles and protocols, the management of viral laryngotracheobronchitis (LTB) and epiglottitis (E) continues to create controversy. Treatment options depend on the etiology of the upper airway obstruction, speed and accuracy of diagnosis, length of time required for treatment, age and clinical status of the patient when first evaluated, severity of the obstruction, presence of complications, experience and skill of physicians, nurses, and respiratory therapy personnel providing care, and the facilities available. This article will review the two most common causes of potentially life-threatening upper airway obstruction seen by the pediatrician: viral laryngotracheobronchitis (LTB) or viral croup and epiglottitis (E). In addition, a third equally life-threatening infectious cause of upper airway obstruction, bacterial tracheitis (BT) will be discussed since it has recently reappeared after a 40-year absence. 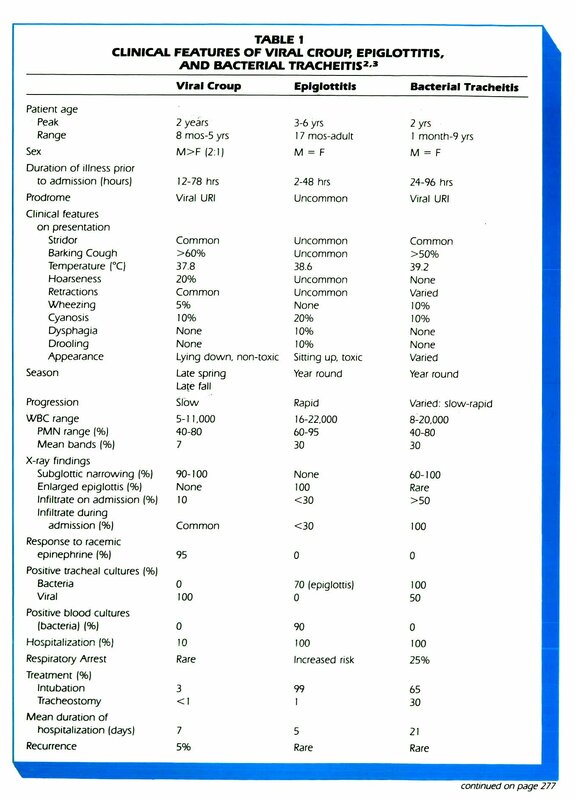 Table 1 summarizes the clinical features of these three infections. Before beginning our discussion, it would be wise for the reader to review the normal anatomy of the upper airway (Figure 1). It is helpful to divide the infectious causes of upper airway obstruction into those that involve the airway below the glottis (infraglottis) and above the glottis (supraglottis). An artificial airway, parenteral antibiotics, and admission to an ICU capable of handling intubated children are the cornerstones of management. Parenteral cefuroxamine or chloramphenicol and a semisynthetic penicillin (eg, oxacillin) are given (until culture and sensitivities from the trachea are available) for a minimum of 10 days. Many reported cases of BT have required intubation for up to 3 weeks because of copious, thick secretions. Chest postural drainage and humidification of ambient air are important. Followup chest x-rays demonstrate infiltrates in 100% of patients. When intubation is necessary for more than 48 hours, adequate parenteral or enteral calories should be provided. Those children who present with respiratory failure or sudden respiratory arrest are at risk for hypoxemia and acidosis and should be managed accordingly. Pulmonary edema has been reported in children with acute upper airway obstruction and should be evident on chest x-ray and be reflected by blood gases. If present oxygen, diuretics (Lasix), positive expiratory pressure, and mechanical ventilation may be necessary to stabilize blood gases and improve lung compliance. 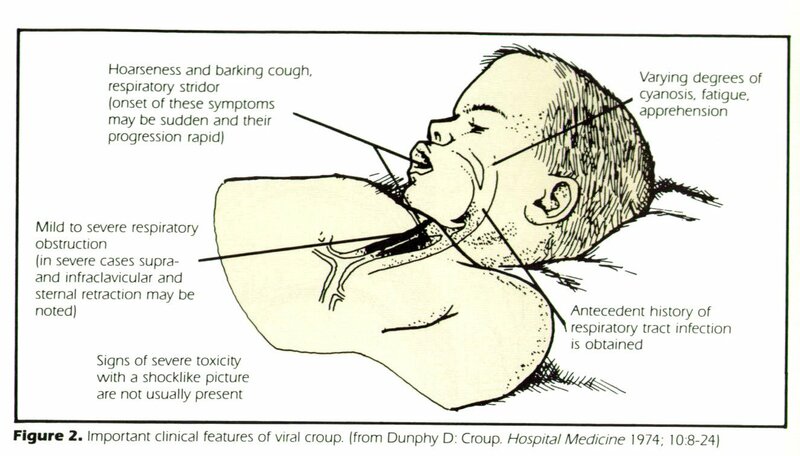 Viral croup is the most common cause of acute upper airway obstruction in children. This infection can be seen throughout childhood into adulthood; however, it is most often seen during the second year of life. It is more common in boys than girls (2:1). Viral croup may be recurrent (more than two episodes) in as many as 5% of patients; this group has an even greater male preponderance, an earlier onset of the initial episode, a familial history of allergies, and chronic post-nasal drip. Children with recurrent croup often have signs of upper (croup) and lower (wheezing) airway obstruction during the viral croup infection and have a predisposition to subsequently develop asthma at a later date. Acute laryngotracheobronchitis: LTB is a viral infection of the subglottic larynx, trachea, and bronchi caused by parainfluenza type 1 and 3, respiratory syncytial virus (most common in children less than 1 year of age, associated with wheezing), parainfluenza type 2, and rhinovirus in order of frequency. With current immunization practices, measles are rarely seen today as a causative agent. LTB is seen throughout the year with a peak incidence in late fall and a smaller peak in late spring. The child with LTB has a prodrome of upper respiratory infection (URI) symptoms for 1 or 2 days (Figure 2) followed by the development of a harsh, barking, croupy cough and hoarse voice. Low grade fever is variable and a mild leukocytosis is occasionally seen. The inspiratory stridor, croupy cough, tachypnea, and retractions typically get worse with crying, agitation, and at night. This picture usually lasts 3 to 5 days during which time the symptoms may progress or remain unchanged and is followed by a convalescent period of 2 or 3 days. The clinical features of LTB are due to inflammation and edema of the larynx and trachea often extending down to the major bronchi of the lungs, hence the term LTB. If the obstruction and infection are severe enough, it can result in ventilation-perfusion mismatch in the lung and increased work of breathing which produces hypoxemia and a clinical picture of suprasternal retractions and sternal recession, particularly in young infants with very compliant chest walls. Signs of hypoxemia (irritability, restlessness, anxiety, tachypnea, and tachycardia) occur before cyanosis is clinically present. Up to 10% of children with LTB require hospitalization for close observation and inpatient management. In the most severe cases the increased work of breathing, hypoxemia, poor oral fluid and caloric intake, and worsening of the upper airway obstruction progress to respiratory muscle fatigue and respiratory failure (hypercapnea and acidosis). Exhaustion may decrease the respiratory efforts made and the intensity of the inspiratory stridor and be interpreted by the inexperienced observer as clinical improvement. In this situation the child will die unless the upper airway obstruction is relieved. Fortunately, only about 3% of children admitted to the hospital with LTB require an artificial airway for relief of the obstruction. Figure 1. Normal anatomy of the upper airway. The diagnosis of LTB is made by history and physical examination and should be confirmed by chest and lateral neck x-rays for those children sick enough to require emergency room evaluation and/or hospitalization. Chest x-rays (PA and lateral) reveal infiltrates (atelectasis and/or bronchopneumonia) in 10% of cases. Both chest and lateral neck x-rays demonstrate subglottic narrowing, the so-called "steeple sign" (Figure 3). Spasmodic croup: The child with spasmodic croup is asymptomatic, goes to bed well, and awakens during the night with a barking, croupy cough, hoarseness, and inspiratory stridor without fever or URI symptoms (Figure 4). The child usually recovers completely by sitting in a bathroom filled with steam from the shower, sitting next to a cool mist vaporizer, or by taking him outdoors (a change in temperature and humidity). By the time these children reach the emergency room they are usually asymptomatic and the parents are often embarrassed. The symptoms may recur over the next 1 or 2 nights with the same rapid relief. The etiology of spasmodic croup is not known. It may represent mild laryngospasm as a result of a hypersensitivity reaction to parainfluenza type 1 infection in children previously infected with parainfluenza type 3 virus.2 X-ray studies and laryngoscopy are normal, since the symptoms are gone by the time the patient is seen by the physician. Bacterial tracheitis: BT is a rare infraglottitis caused by a localized bacterial infection of the trachea and major bronchi. Inflammatory edema, purulent exudate, and occasionally a pseudomembrane are present. Males and females are equally affected. Clusters of cases throughout the US have been reported over the past 6 years, too few to demonstrate a seasonal occurrence.5 The early clinical picture and age range are quite similar to LTB. After 1 to 3 days of what appears to be LTB, the child with BT develops a high fever, leukocytosis, and appears toxic with severe upper airway obstruction unresponsive to standard viral croup treatment. The causative organisms are summarized in Table 2. BT is apparently a localized infection of the trachea and main bronchi without bacteremia or extrapulmonary foci; the only positive cultures are from tracheal secretions. In many cases bacteria and parainfluenza viruses have been cultured from the trachea which has led some to believe that BT is a bacterial secondary infection in children with viral LTB. In a recent review of reported cases of BT, there was a 25% incidence of sudden respiratory arrest occurring spontaneously, during agitation or physical examination of the child by a physician. 5 Many children with BT are admitted to the hospital with a diagnosis of LTB. They fail to respond to standard LTB treatment, have high fevers, and become progressively worse. The diagnosis is made at the time of emergency intubation for respiratory arrest or elective intubation for respiratory failure when exudate and/or a pseudomembrane is found occluding the trachea and filling the endotracheal tube. Chest x-rays on admission reveal infiltrates in 50% of cases and together with lateral neck x-rays are consistent with subglottic narrowing as is seen in LTB. One should suspect BT early on in the child with severe LTB admitted to the hospital with a high fever and leukocytosis who does not respond to viral croup treatment. 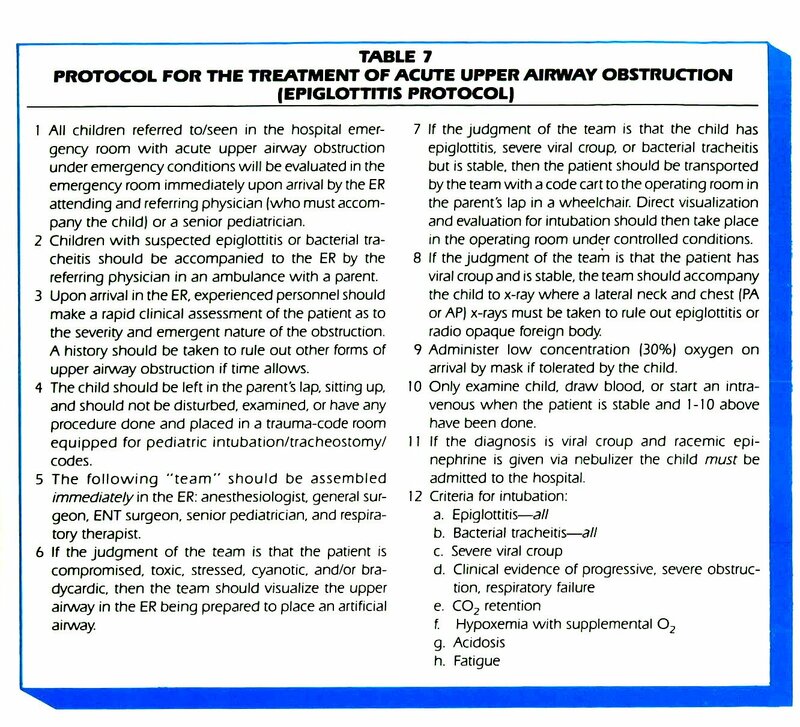 Because of the high risk of sudden respiratory arrest, when BT is suspected the patient should be managed in a fashion similar to those with suspected epiglottitis (minimal agitation, keep sitting up in a parent's lap, no examination, no procedures) and the hospital epiglottitis protocol utilized (see below) so that the upper airway can be inspected as soon as possible under controlled conditions in the operating room (ICU or emergency room if clinically unstable) by skilled, experienced personnel capable of establishing an artificial airway. Figure 3. Subglottic narrowing (steeple sign) seen in viral croup on chest (AP) x-ray. Epiglottitis, much less common than LTB, is one of the most serious forms of acute upper airway obstruction which the pediatrician is called upon to manage. It is defined as acute inflammation and edema of the epiglottis and ary-epiglottic folds, not involving the pharynx or subglottic structures. 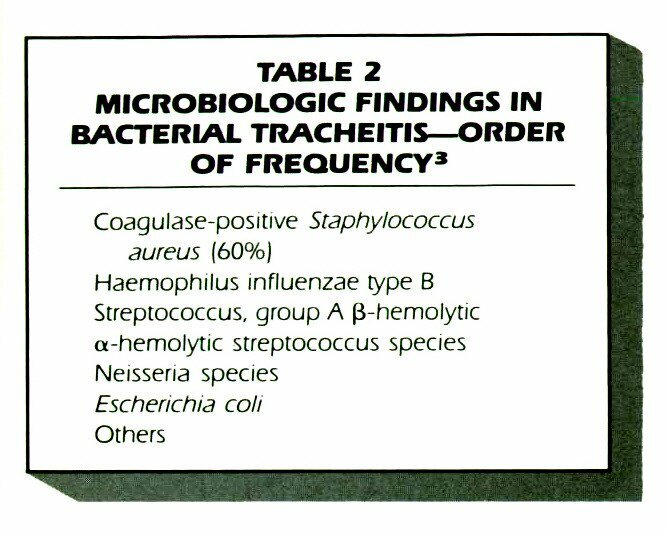 Haemophilus influenza type B is the most common pathogen, however occasionally beta-hemolytic streptococci have been recovered from epiglottis cultures. Septicemia is responsible for the toxic features of this infection and occasionally extra-epiglottic foci are seen as well (pneumonia, cellulitis, otitis media, septic arthritis, meningitis). Up to 90% of blood cultures and 70% of epiglottis cultures reveal a pathogen. The incidence of E is equal for males and females. E is most common between 3 and 6 years of age, however it can be seen in adolescents and even adults. It is seen year round without a seasonal pattern in most areas. The onset of symptoms with E is rapid and sudden, rarely it is preceded by a viral URI picture. The first signs are high fever and lethargy (Figure 5). Rapidly over the next 24 hours sore throat and difficulty swallowing appear. The child becomes tachycardie, pale, irritable, apprehensive, and toxic. Breathing becomes noisy and the child assumes a tripod position sitting up with the head and neck extended (no doubt to keep the upper airway open). Ten percent of patients drool due to an inability to swallow saliva and will refuse oral fluids. Cough is uncommon, the voice or cry is muffled, and inspiratory stridor is much softer and lower when compared to LTB. Clinical signs of hypoxemia, cyanosis, and retractions may be present, depending on the degree of upper airway obstruction present. Respiratory arrest may occur suddenly without warning (due to complete upper airway obstruction) and may be provoked by crying or agitation (examining the child or performing procedures - IV placement, phlebotomy, x-rays). Epiglottitis should be suspected by history and clinical picture alone. A child with suspected E should be left alone, undisturbed, preferably sitting in the parent's lap, and have no procedures or physical examination done. This requires clinical assessment by skilled, experienced medical personnel. A foreign body in the upper airway can produce inspiratory stridor and a croupy, distressing cough. The patient is often unable to talk. There may be a history of a choking spell while playing with small toys or eating. The possibility of a foreign body should be raised with every case of acute upper airway obstruction. Remember many foreign bodies will be radiolucent on x-ray and if below the larynx, wheezing may also be seen. The child's immunization status must always be checked. Diphtheria is uncommon today but must be the presumptive diagnosis in an unimmunized child with a membrane on the tonsils and/or pharynx. Also consider infectious mononucleosis when a membrane is present. Measles can also present with a croup prodrome; these patients should be admitted and isolated to protect immunocompromised children on the pediatric ward. The child with recurrent or persistent stridor or a clinical picture of LTB at the wrong time of year should alert the pediatrician to look for congenital anomalies and other causes of upper airway obstruction. These children often require chest and magnified soft tissue lateral neck x-rays, cardiac evaluation (EKG, echo, and barium swallow) to look for vascular rings and congenital heart disease. 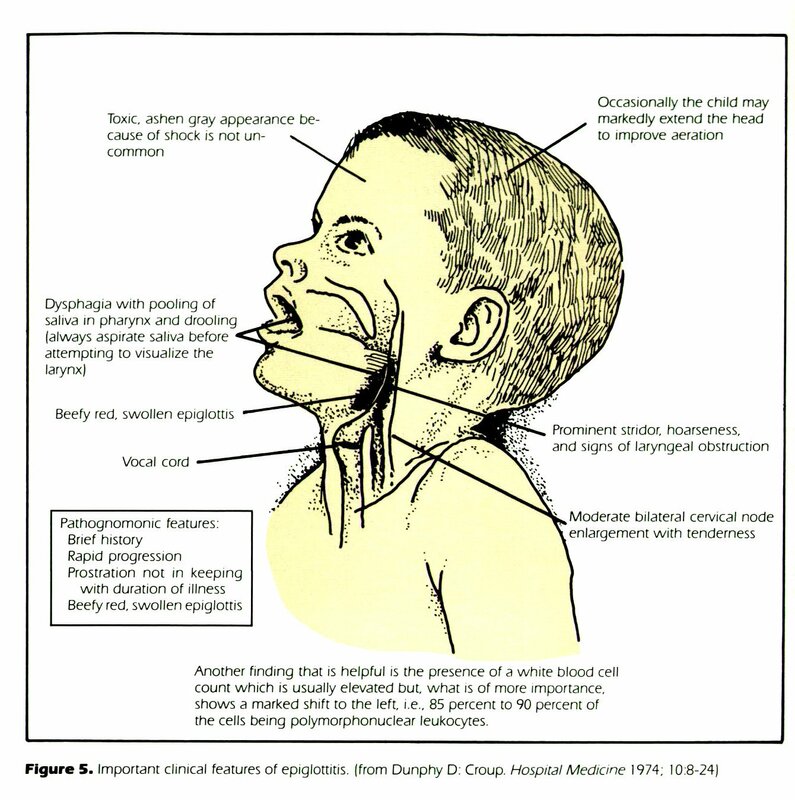 The infant with a cutaneous hemangioma and recurrent croup has a high risk of having a tracheal hemangioma which may cause continuous or intermittent stridor. Laryngo/tracheo-malacia can best be diagnosed by direct inspection of the upper airway during breathing. 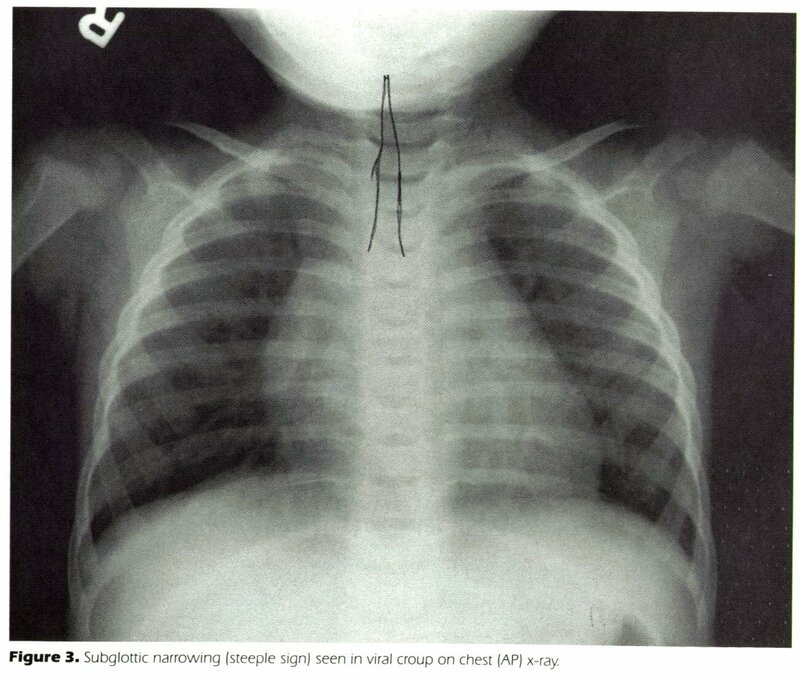 The infant with a history of upper airway manipulation or intubation in the newborn period may have acquired tracheal stenosis resulting in recurrent croup with viral URIs. 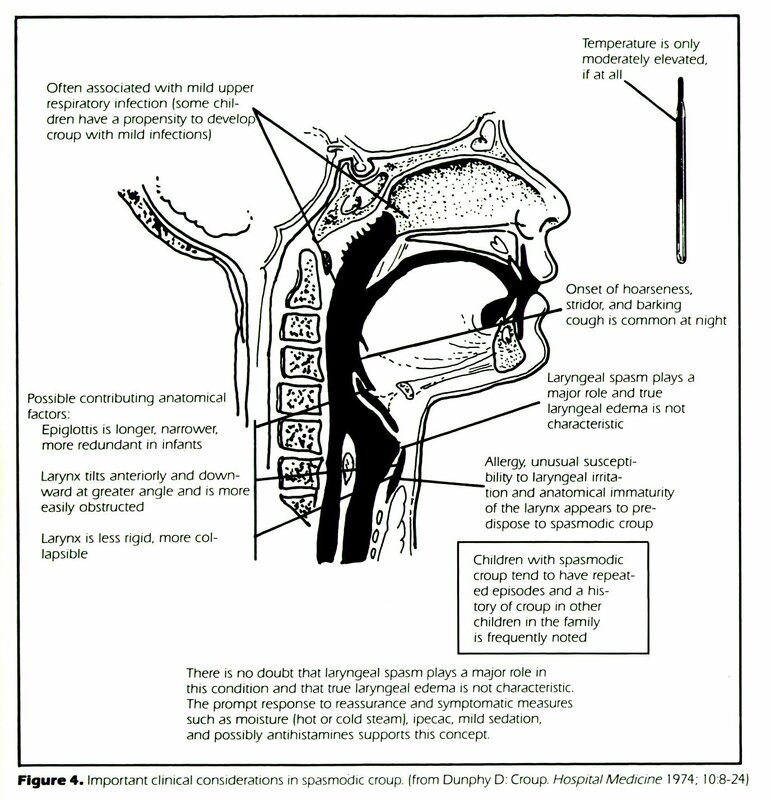 Laryngospasm and/or edema of the upper airway can occur with a severe allergic reaction. Patients with a history of recurrent angioneurotic edema, especially with a positive family history, should have familial angioneurotic edema ruled out by obtaining C1 esterase inhibitor and complement (C3, C4) levels during periods of acute symptoms and edema. When the diagnosis of upper airway obstruction is uncertain, direct visualization of the upper airway by experienced personnel using a pediatric flexible fiberoptic nasopharyngoscope or bronchoscope should be considered early in the evaluation period when the patient is still symptomatic but stable. Home management: More than 90% of children with LTB can be safely managed at home by reliable parents. The child should be kept calm and comfortable (which often requires a parent to be with the child while awake) and in mist when symptomatic. The child's crib can easily be made into a simple croup tent by placing sheets over the top and sides and positioning a cool mist humidifier/vaporizer next to the crib directing mist into the tent. A less practical alternative is to run the shower with the bathroom window and door closed and sit in the steam filled bathroom with the child. Adequate oral fluids should be offered to provide hydration and calories. Antibiotics, corticosteroids, sedatives and racemic epinephrine via nebulizer have no place in outpatient croup treatment. For a fever≥101°F antipyretics (acetaminophen) should be given to provide comfort, reduce oxygen demands, and avoid an increase in respiratory and cardiac work and increased fluid demands. If you have seen the child early in the day, remember that LTB usually gets worse at night; check with the family later in the day and re-examine if necessary; close follow-up is important. 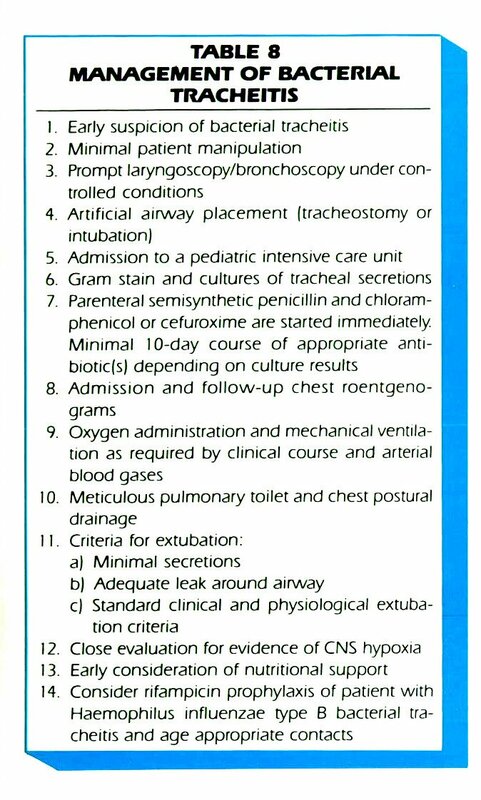 Indications for hospitalization are summarized in Table 3. When hospital admission is uncertain and facilities and personnel are available, you may elect to watch the child in a mist tent in the emergency room for a few hours. Remember, if you treat with nebulized racemic epinephrine, you must admit to the hospital (see below). Hospital Management: The management of LTB in the hospital has been hindered by a lack of objective monitoring measurements that reflect the degree of upper airway obstruction, the presence of fatigue and respiratory failure, and response to therapy. Serial pulmonary function testing, x-rays of the upper airway, and arterial or capillary blood gases have been used, but are impractical and require disturbance of the child which makes the croup worse. 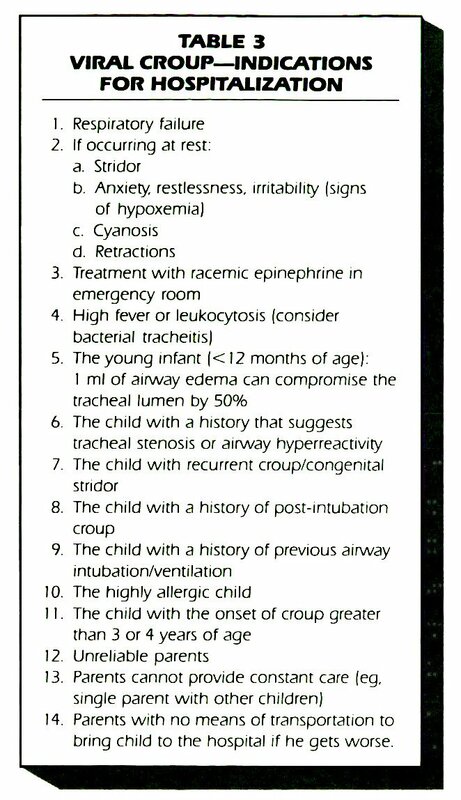 The use of clinical croup scores (Table 4) has not gained universal acceptance. Children with LTB should be admitted to a patient care area that will allow parents to stay with them yet provide close monitoring and nursing evaluation. We have found that using the clinical croup score allows for better communication between changing personnel (nurses, house staff, respiratory therapists). Children who are deteriorating or in moderate to severe distress should be monitored and managed in an intensive care unit (ICU) with skilled nurses and respiratory therapists capable and comfortable with managing such a case, otherwise early transfer to a hospital with a pediatric ICU is indicated. In our pediatric intensive care unit, we have found that in addition to having a parent present (if possible) to calm the child and adequate pediatric nurse and respiratory therapist staffing, the use of a croup flow sheet (Figure 6) and transcutaneous O2 and CO2 monitors has greatly improved our management of LTB. All children with LTB admitted to the hospital should have lateral neck and chest (PA or AP, lateral) x-rays taken on admission. These x-ray studies not only confirm the presence of subglottic swelling but more importantly rule out atypical epiglottitis. The child should be accompanied by personnel equipped to intubate the child and the necessary equipment kept at the bedside at all times. The average length of hospitalization for most children with LTB is 5 or 6 days, however over the past 2 years we are seeing a small number of children with croup, wheezing, and prolonged (2 to 3 weeks) hospitalization who require laryngoscopy/bronchoscopy and intubation. 1. Minimal disturbance: any stimulus that disturbs the child will result in crying and hyperventilation and worsen the croup. We often encourage the parent to hold the child in the mist tent while awake. Continuous heart rate, respiratory rate, croup flow sheet, and transcutaneous O2 and CO2 monitoring in the ICU is ideal for the patient with LTB in moderate to severe distress. 2. Fever control to reduce O2 consumption and provide comfort should be achieved by using acetaminophen rather than tepid sponging. 3. Oxygen and mist: hypoxemia can be improved by placing the child in a croup tent with 30% O2. Face masks, nasal cannulae, and head boxes are poorly tolerated by this age group. Cool humidification of ambient air soothes irritated upper airways. Animal studies have shown that droplet deposition on upper airways may reflexly alter the pattern of breathing to reduce the work of breathing and improve flow rates. Wean the patient out of the O2 and then mist for 24 hours prior to discharge. 4. Hydration: In most cases this can be provided in the form of oral fluids. If poorly tolerated or the child is too sick, parenteral fluids should be started early; children who are clinically dry on admission should alsc receive intravenous hydration. Close observation of intake and output is required; pulmonary edema can result from upper airway obstruction or as a result of too vigorous hydration. 5. Racemic epinephrine should only be used on inpatients with LTB. Its use is based on its topical vasoconstrictive (alpha-adrenergic) effect on the inflamed, edematous subglottic mucosa. Its mild beta-adrenergic effects may reflexly reduce laryngospasm or tracheal muscle constriction. Racemic epinephrine does not alter the duration of LTB, only its severity, since significant upper airway obstruction can recur when its effects have worn off (rebound). The recommended dose is 0.5 ml of 2.25% solution diluted with 3.5 cc of water (1:8) delivered via a nebulizer with a mouth piece held in front of the child's face. The dosing interval depends on the severity oí the LTB: it can be given as frequently as every 20 to 30 minutes if the patient is monitored in an ICU and every 4 to 6 hours on the floor. As the child recovers, wean the frequency of treatments. Discharge should not be planned until the child has not required a treatment for at least 24 hours. Figure 6. 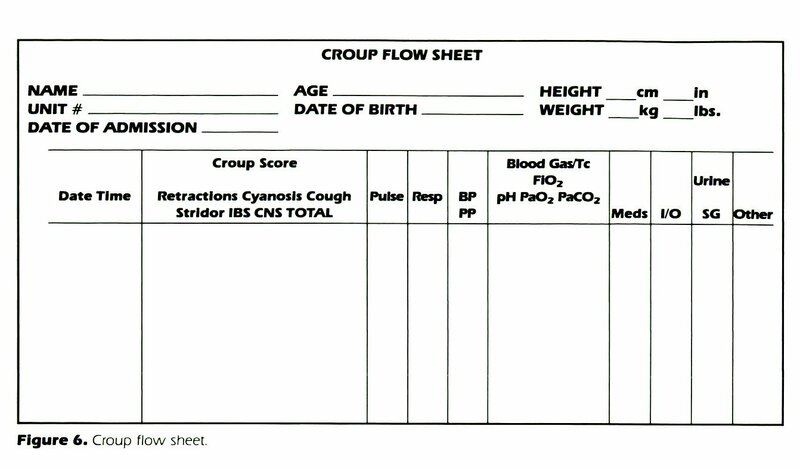 Croup flow sheet. 6. Antibiotics have no place in the management of LTB unless the patient also has otitis media or strep pharyngitis. Most infiltrates seen on chest x-ray represent atelectasis and/or viral bronchopneumonia. 7. Corticosteroids: There is no evidence to suggest that steroids alter the course of LTB; nor is there evidence that a short course of steroid therapy will be harmful. A reasonable approach would be to use parenteral steroids for the child (without E or BT) who is deteriorating or not improving despite adequate therapy. 8. Other drugs: Helium-oxygen mixtures (70% to 30%) have been used to decrease the work of breathing in children with LTB. The lower density helium (compared to nitrogen in room air) improves gas flow through the obstructed upper airway. 9. Artificial airway: Respiratory failure in LTB is most often due to fatigue with progressive hypercapnea, acidosis, and hypoxemia. Successful management of the obstructed airway depends on a team approach and the facilities available. Intubation (the procedure of choice) or tracheostomy are safe when done properly, however either can produce serious complications if inexperienced personnel and inadequate facilities are available. In a hospital without a skilled person who can intubate and who is present 24 hours a day, adequately trained nursing and respiratory therapy staff, and an ICU capable of handling infants and children, early transfer to a referral hospital or an emergency tracheostomy by surgery are the two choices. Nasotracheal intubation is the preferred technique to provide an artificial airway because of its low morbidity and mortality when compared to tracheostomy. Close, objective monitoring is essential in managing LTB; elective intubation by skilled personnel is much safer than an emergency intubation or tracheostomy done during a code for respiratory failure. 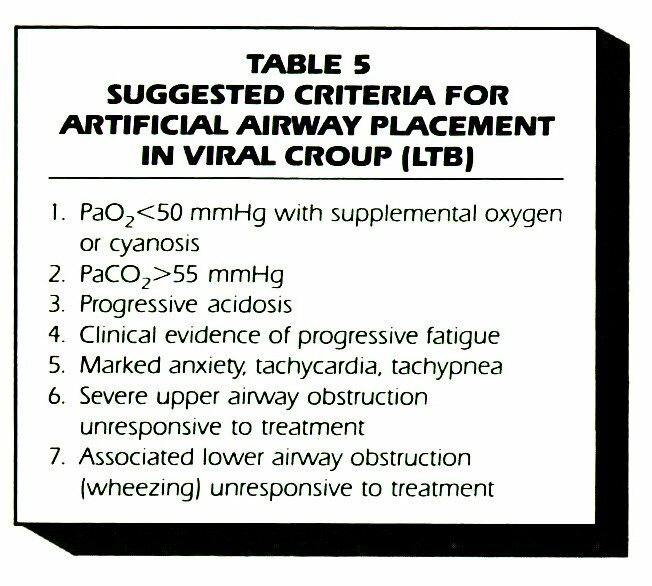 Suggested criteria for artificial airway placement in viral croup are listed in Table 5. In the elective intubation, the child can be taken to the operating room and given a general anesthetic and O2 by assisted ventilation with bag and mask. When asleep, the upper airway is inspected and gently intubated with a small, uncuffed polyvinyl chloride endotracheal tube with stylette. 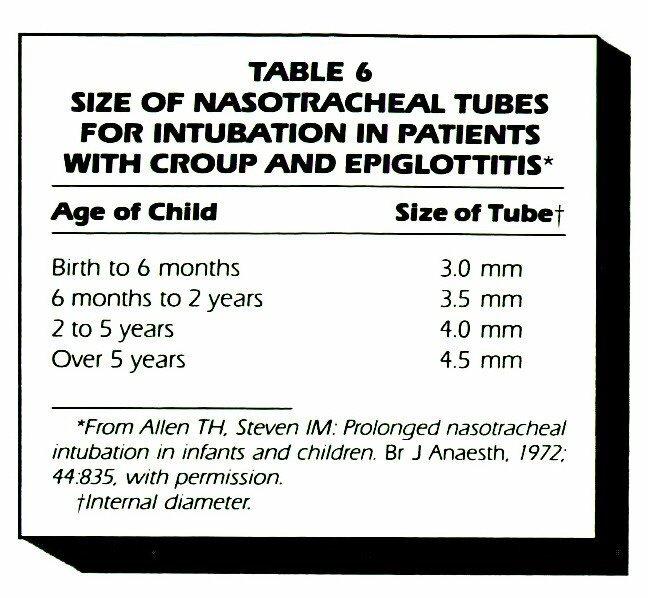 After adequate airway toilette, the tube is then removed and a small uncuffed nasotracheal tube is placed (Table 6). Once the tube is secured, ventilation of the lungs is checked by auscultation of the chest (and following transcutaneous CO2 if available). Tube placement is confirmed by chest x-ray. The child can then be transferred to the ICU. Constant nursing care, adequate humidification of inspired gases, and 2 to 3 cm of continuous positive airway pressure (CPAP) are essential to prevent accidental extubation, mucus plug blockage of the tube, and atelectasis. Provide oxygen and suction hourly as needed. Chest postural drainage should be performed if atelectasis or infiltrates are present, frequency to be determined by the child's fatigability. Elevate the head of the bed 30° and restrain the arms to prevent accidental extubation. If the child is fighting the tube, see if a parent or nurse can calm the child. If this is not successful, check transcutaneous monitors and arterial blood gases. If the blood gas is normal, you may then try mild sedatives to improve tube tolerance being careful not to depress respiratory drive. The duration of intubation is usually 2 to 5 days. Once the secretions have decreased and thinned out, an air leak developed around the tube, and any atelectasis expanded on chest x-ray most children are ready for extubation. The child should be observed in the ICU in a mist tent with supplemental oxygen and nebulized racemic epinephrine as needed for 1 to 2 days before being transferred to the floor for routine LTB care. If the subglottic swelling is so great that only a very small tube (greater than two sizes smaller than expected) can be passed, check ventilation and blood gases. If adequate ventilation cannot be achieved, a tracheostomy should be performed immediately. Once the diagnosis of E is suspected, the child should immediately be admitted to the hospital and an "Epiglottitis Protocol" put into action. If seen in a clinic or office, the patient should be transported to the nearest and "best" emergency room by the referring physician in an ambulance in the parent's lap with equipment to establish an airway and ventilate if necessary. Call ahead so the emergency room staff can evoke the "Epiglottitis Protocol" (Table 7). A "team" consisting of, at minimum, a senior pediatrician and general surgeon or ENT surgeon, anesthesiologist, and respiratory therapist, should assemble in the emergency room as soon as possible (preferably before the child arrives) and have equipment ready for emergency airway placement if the child is toxic and unstable. If the team does not clinically suspect E, lateral neck and chest (PA or AP, lateral) x-rays should be performed to confirm LTB and rule out a radio-opaque foreign body immediately before examining the child or performing invasive procedures. 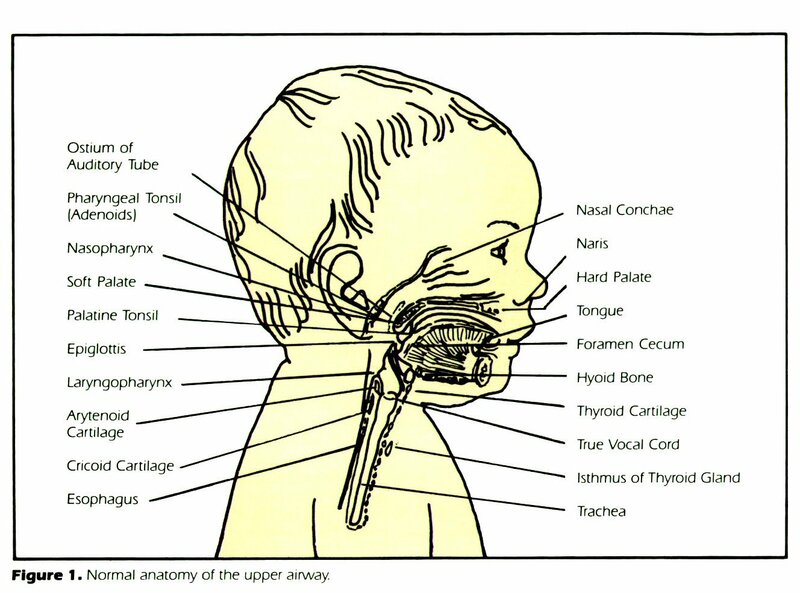 If a swollen epiglottis is seen on the lateral neck x-ray (Figure 7) and the child is stable, plans should be made to intubate the child in the operatingroom as soon as possible. Until an airway is securely in place, the team should accompany the child to radiology and the operating room. 1. Minimal disturbance/ position: With E the risk of sudden upper airway obstruction is high; any event/ procedure that may disturb the child should be avoided. The child should be kept sitting up, preferably in the parent's lap and both transported in a wheelchair. Under no circumstances should the child lie down, be examined, have blood drawn or an intravenous line started. 2. Oxygen and humidification: Attempt to provide 30% oxygen with humidity (if the child will allow it) by mask or the parent holding the mask near the child. Blood gas measurements are risky before intubation and post-intubation provide little useful data. 3. Hydration: With E there is often a short prodrome and dehydration is usually not a problem. Parenteral fluids are required once intubation has occurred. 4. Antibiotics: After airway placement and stabilization, a blood culture and epiglottis culture should be obtained, an intravenous line started, and intravenous cefuroxime 150 mg/kg/day every 8 hours or chloramphenicol 100 mg/kg/day every 6 hours started immediately. 5. Other drugs: There is no place for racemic epinephrine or steroids in the management of E.
6. Artificial airway: Failure to establish an artificial airway once the diagnosis of E has been made is unsafe regardless of the patient's age or how well he looks and is associated with a mortality of up to 6%. If the child appears toxic, cyanotic, is bradycardiac, or arrests - -immediate upper airway inspection with a laryngoscope and intubation should take place in the emergency room by the most skilled person available. When E is clinically suspected, time permits, and the child is stable, the team should transport the child to the operating room. Anesthesia is induced in the sitting position with halothane and oxygen. Once under anesthesia, the upper airway is inspected with a laryngoscope on the operating table and the trachea intubated with an endotracheal tube (uncuffed). After suctioning and ventilation, the anesthesia is deepened and a nasotracheal tube is placed (the same size as for LTB, Table 6) and secured in place and ventilation checked by auscultation of the chest. Tube placement must be confirmed by chest x-ray. Epiglottis and blood cultures are then obtained and an intravenous line and antibiotics are started. If the child cannot be rapidly intubated and E is found or the personnel and facilities do not allow for easy intubation, then a rapid and neat tracheostomy should be performed by a skilled surgeon to allow for airway stabilization. In the operating room or emergency room, once the airway is secured, an IV started and antibiotics given, and the team is ready to move, the child should be immediately moved to an ICU capable of caring for an intubated child. If adequate pediatric intensive care facilities and personnel are not available, the child should be transported by personnel capable of intubation (should the tube come out) to a referral hospital which can provide such care. Under no circumstances should a child with E be transported without a secure airway in place. Figure 7. 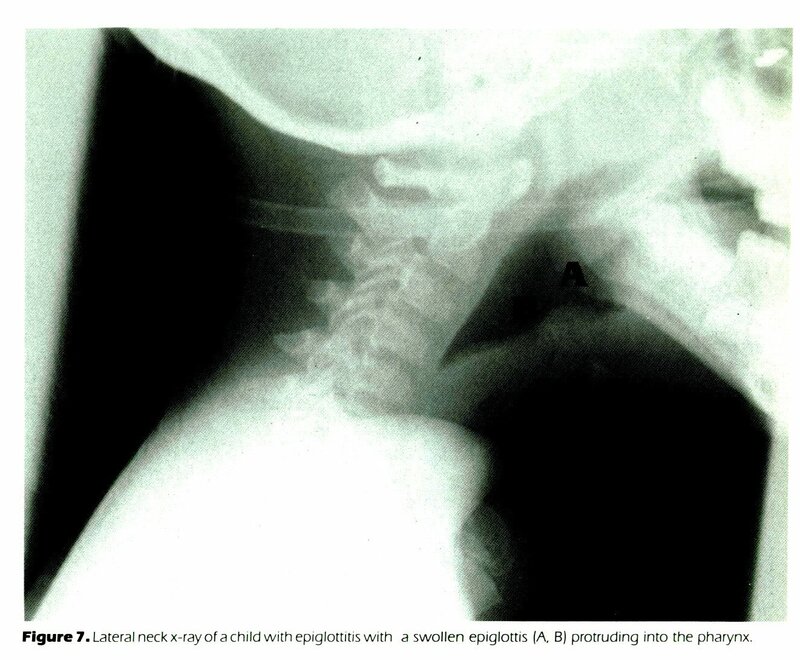 Lateral neck x-ray of a child with epiglottitis with a swollen epiglottis (A. B) protruding into the pharynx. After intubation, arm restraints and airway humidity are required to prevent accidental extubation and plugging of the tube by secretions, both which can cause significant morbidity and mortality. The airway should be suctioned hourly and as needed. Rarely is supplemental oxygen required. Television, games, child life personnel and parents are the best sedation for these children once the anesthesia wears off, the fever subsides, and they feel better; sedatives are rarely required. Blood gases or transcutaneous gas monitoring are seldom needed. Remember to examine the child in the ICU for other foci of infection (lungs by chest x-ray, skin, joints, ears, and if meningeal signs are present a lumbar puncture should be performed). Twenty-four hours of antibiotics are recommended before considering extubation. The epiglottis is inspected daily with light sedation (Pentothol 2 to 3 mg/kg IV or Valium 0.1 to 0.2 mg/kg IV) with a nasopharyngoscope (preferably) or a laryngoscope by skilled personnel. When signs of sepsis have resolved, the ability to swallow has returned, and the glottic swelling has resolved, the child can be extubated. Temperature need not be normal at the time of extubation. The usual length of intubation is 24 to 36 hours. When the tube is removed, the child should be observed in the ICU for an additional 24 to 48 hours in a mist tent and nebulized racemic epinephrine used as needed to control croup symptoms. The child can then be transferred safely to the pediatric floor to complete a 10-day course of antibiotics: cefuroxime, chloramphenicol, or ampicillin (depending on the sensitivities of the organism). One should consider rifampin prophylaxis for the patient and daycare/family contacts as in other forms of invasive Haemophilus influenza type B infections. The management of BT is summarized in Table 8. Because of the 25% risk of sudden respiratory arrest in reported cases, early suspicion of BT is of paramount importance. The child with what appears to be LTB with poor response to therapy, especially with high fever and leukocytosis should have early, elective visualization of the upper airway in the operating room or ICU under controlled conditions by experienced personnel - the epiglottitis team and protocol would seem appropriate here. Prior to the 1970s most children with severe LTB and all children with E were managed by tracheostomy. A tracheostomy in any child has a morbidity and mortality regardless of the indication for the procedure. When a number of centers started using nasotracheal intubation rather than tracheostomy, the morbidity, mortality, and length of hospitalization were significantly reduced. With either artificial airway there is a risk of accidental extubation or plugging and respiratory arrest. Prolonged intubation for LTB may result in tracheal stenosis. Prolonged tracheostomy has a risk of inability to wean off the trach, granuloma formation, and requires very compliant and careful parents if the child goes home with the trach. Children with E are at risk for extra epiglottic foci of infection, each with its own complications. Extra pulmonary air (pneumomediastinum, pneumothorax) has been reported in LTB, E, and BT and is one of the reasons for obtaining a chest x-ray on all hospitalized children. Infants and children with respiratory syncytial LTB often have upper airway (croup) and lower airway (wheezing, bronchiolitis) obstruction and require separate management for each. E: In a follow-up study of children with E, we found no evidence of airway obstruction or airway hyperactivity, but a number of them had smaller lungs than controls (E. K. Motoyama, P. Rothstein, J. Hen, unpublished data). 1 Barker GA: Current management of croup and epiglottitis. Pediatr Clin Ninth Am 1 979; 26:565-579. 2. Levison H. Tabachnik E, Newth CJL; Wheezing in infancy, croup and epiglottitis. Cutt Probl Pediatr 1982; 12:58-65. 3. Hen J: Bacterial Tracheitis- Dé,à Vu. Comn Med 1984. 4S.417-419. 4. Hen J: Bacterial Croup: Request for data. J Pediatr 1985; 105:855. 5 Strope OL. Stempel DA Risk factors associated with the development of chronic lung disease in children. Pedaitr Clin North Am 1984. 51:757-771.